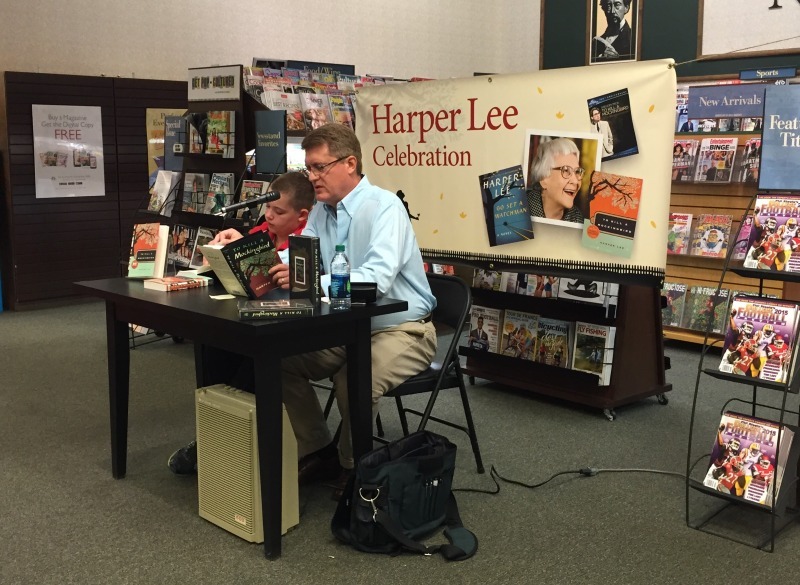 As shoppers perused the books and trinkets at the Cool Springs Barnes and Noble Booksellers Monday morning, snippets of “To Kill a Mockingbird” — read aloud by various local personalities — floated through the air. The event started out with a little bit of a change-up from the original lineup of readers, as U.S. Rep. Marsha Blackburn (R-Brentwood) — scheduled to read first — had to cancel due to a last-minute flight reschedule. However, local lawyer and Barnes and Noble employee Mark Mayhew stepped in to fill Blackburn’s slot even though he was scheduled to read an hour later. One or two shoppers hovered nearby as Mayhew read, but no one sat in the 20 or so chairs set up for the event early Monday. Robbie Bryan, the store’s community relations manager, said he hadn’t anticipated a large turnout for the read-a-thon, but more of an audience that drifts in and out throughout the day. Mayhew was scheduled to read several more times Monday. Other readers include Killer Nashville writers conference founder Clay Stafford with son, Ellis; Al Nations, retired Williamson County General Sessions Court judge; and Clint Redwine from the MIX 92.9 Morning Show. Stafford said Killer Nashville, a conference for thriller, mystery and crime literature, is part of the reason he came to read from “Mockingbird.” He has read the book several times throughout his life and brought his son to show the impact such a novel can have. Bryan said the event is broken into 30-minute slots, although others like Mayhew, have chosen to do more than one, or extend their slots. Those volunteers were scheduled read until 9:30 p.m. Monday night. As for “Watchman,” Bryan said the store is prepared for the 7 a.m. Tuesday release. Those who choose to buy their copy between 7-10 a.m. also will receive a free tall coffee from the in-house cafe. “[‘To Kill a Mockingbird’] is definitely an icon,” Bryan said. “Just the history of the book — it’s published in 1960, immediately hits the bestseller list, the very next year it wins the Pulitzer Prize, the year after that it’s made into a film that won three Oscars, it’s just phenomenal. Allison Maloney is the assistant managing editor at Home Page Media Group. You can follow her on Twitter at @allieleora, or read more on her blog, littlebitwrites.wordpress.com. Email: allison@homepagemediagroup.com.